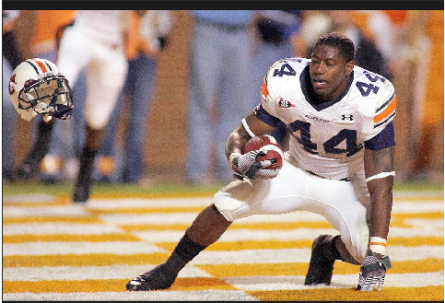 The Draft is 20 days away, and if it’s still not quite as exciting* for Auburn fans as it was at the height of the Tubby era, I’m still pretty stoked about seeing the guy pictured above getting his due. Which, apparently, he will. Ben Tate‘s stellar combine performance and general all-around badassitude have potentially pushed him all the way into the lower reaches of the second, according to a couple of early mock drafts dug up by Bryan Matthews. I’m not sure how much credence to put into the opinion of “WalterFootball.com”**, but hey, maybe CBS Sportsline’s endorsement does mean good things. The NFL brought 35 corners to Indy [for the combine]. It’s baffling that McFadden, our No. 19 at the position, wasn’t one of them. At 5′ 10″, 170 pounds, he’s short and needs to add bulk. But that’s nothing a few hundred protein shakes and trips to the weight room can’t fix. His instincts and closing burst are already in fine shape. (He pulled down nine career picks as a Tiger.) So don’t be shocked if he turns into a consistent contributor as a subpackage cover corner by his second season in the NFL. Let’s hope in this case McShay is truly representative of NFL thinking rather than flying in the face of it. Which, if last year was any indication, he very well could be. Did anyone expect Jerraud Powers to be a first-day draft pick and wind up starting in a Super Bowl at this time last year? No. With Tate and McFadden already receiving buzz that they might have been undervalued at the close of the season, maybe we’ll get to see something similar come April 22. *Given definition of exciting here, since we’re talking about 12 hours of Chris Berman talking to Mel Kiper punctuated by 10 seconds of interest when a team makes a pick. Yes, I watched the draft religiously for years anyway. **Then again, it’s the amateurs that usually rule the roost when it comes to bracketology, so maybe WalterFootball.com’s got a better angle than Kiper. Can’t rule it out. To jump off of one of your postscipts, I am bitter that the NFL chose to turn the Draft into a four day event. It was one of the better excuses to begin drinking at 11:00 a.m. that didn’t occur from September to December. I am really going to miss the fun of being one of ten people at a sportsbar mid-morning; acting like a geek and not ashamed to know who the 38th ranked wide receiver was. Good times that shall be missed.